In order to provide a sample scene that could be used to configure and test ScreamerNet with DLI SNUB Launcher I created the DLI_SuperBalls Benchmark Scene and included it with the DLI SNUB Launcher download. 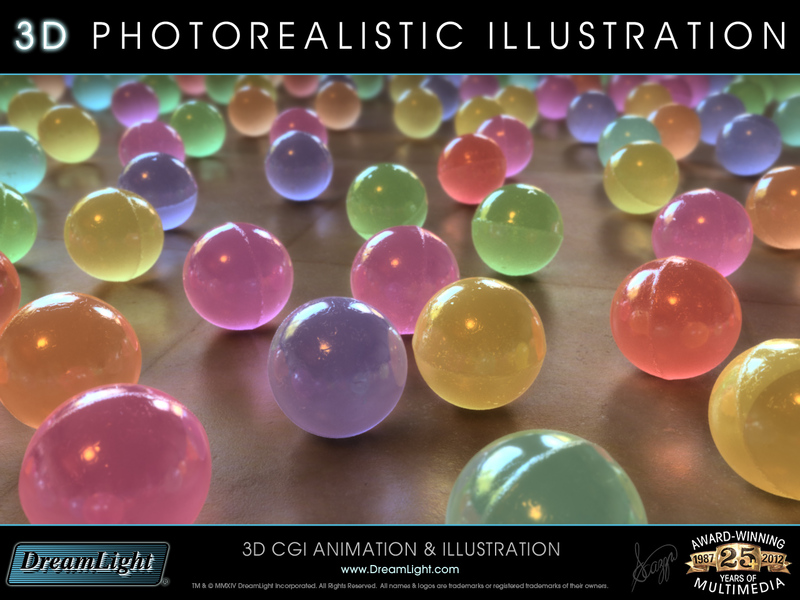 I also used this scene to benchmark the speed of our computers and to test LightWave’s nodal textures for SSS subsurface scattering and built-in instancing with randomly colored translucent balls. You may use this scene to test setting up DLI SNUB Launcher as well as to benchmark the speed of your own computer’s rendering abilities. Work through these short step by step how to Render Tutorials with DLI_SuperBalls Benchmark Scene to get LightWave 3D ScreamerNet LWSN up and running fast. 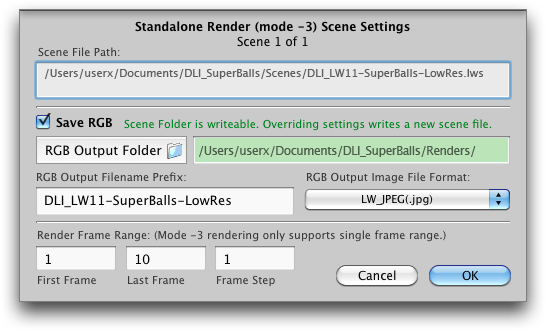 DLI_SuperBalls-LowRes.lws – Renders in about 4.5 minutes on a first generation 12-core Mac Pro. 25% resolution with lower AA, DOF and Radiosity settings. Exports a JPG image. 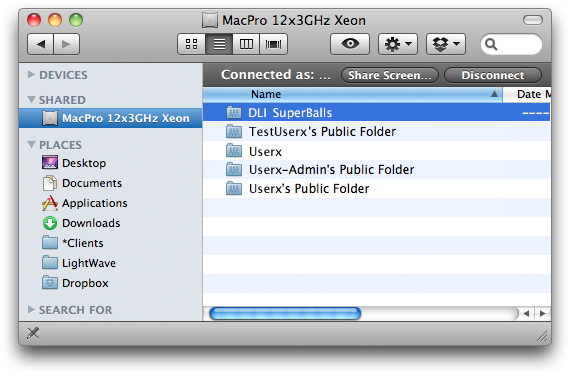 DLI_SuperBalls-HighRes.lws – Renders in about 2 hours on a first generation 12-core Mac Pro. 100% resolution with full AA, DOF and Radiosity settings. 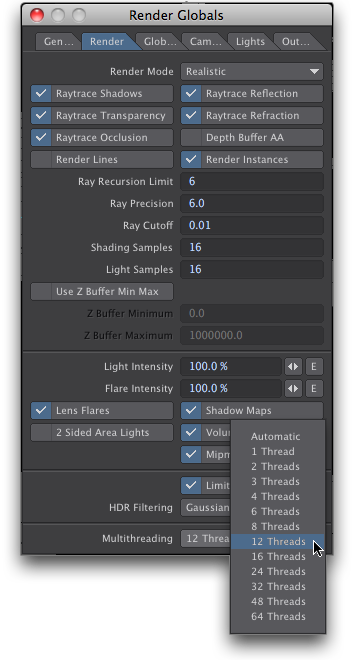 Exports a linear HDR EXR image (and optional HDR depth buffer) ready for HDR post-processing in HDR compositing software like Shake, Fusion or After Effects. 25% resolution with much lower AA, DOF and Radiosity settings. Exports as JPG images. The following DLI_SNUB-Launcher / DLI_SuperBalls Quick-start Tutorials are available. For best results go through all three of them in order because each quick-start tutorial builds upon what you’ve learned in the previous tutorial. 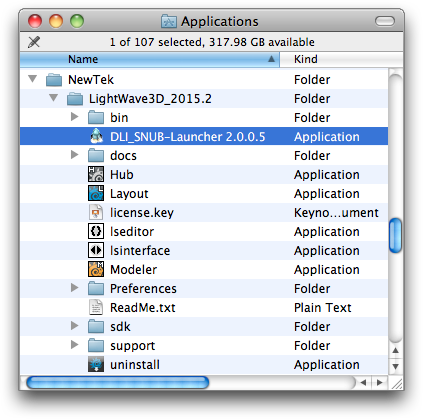 Move or copy the DLI_SNUB-Launcher 2 application into your LightWave3D folder if not already there. 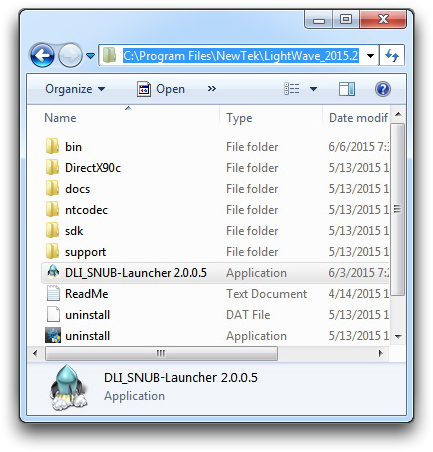 Launch DLI_SNUB-Launcher. If this is the first time it is run it should locate lwsn and LightWave’s config folder by default. Success locating the file/folder will be indicated by the lwsn Path and Config Folder fields being highlighted in green. If not found, the fields will be highlighted in red instead. In that case just drag LightWave’s bin folder, or lwsn file to the lwsn Path button or field and drag the config folder to the Config Folder button or field on the DLI_SNUB-Launcher window. Drag the DLI_SuperBalls-LowRes.lws scene and drop it onto the Open Scene for Standalone Render (-3) button or onto the DLI_SNUB-Launcher 2 icon on the desktop or the Dock/Taskbar to open the Scene Settings Panel. Then check and/or set the RGB Output Folder to the folder where you’d like to save the renders by clicking the button or dragging a folder to the button or field. Set the RGB Output Filename Prefix field to what you’d like to name the render files. Select an RGB Output Image File Format for the rendered image files. Set the desired Render Range, and click OK to render the scene. 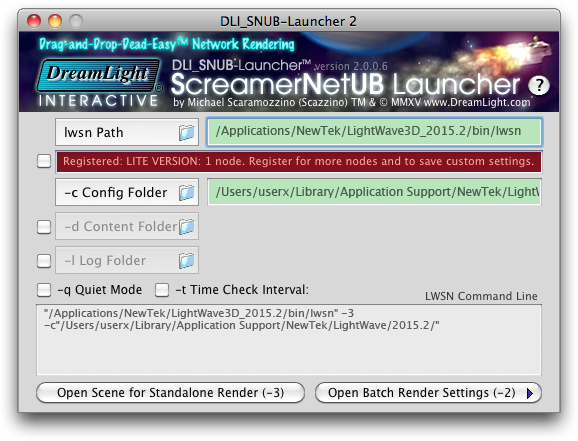 For additional step-by-step tutorials on how to use DLI_SNUB-Launcher for background standalone rendering please refer to our in-depth white paper Mastering LightWave 3D ScreamerNet LWSN. 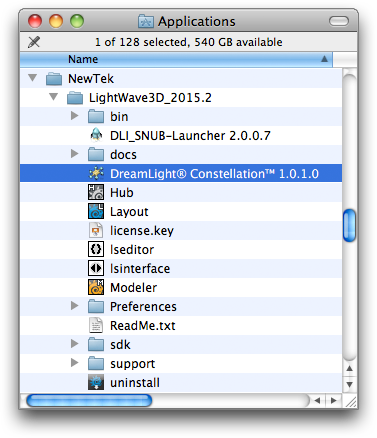 If you haven’t already, move the DLI_SNUB-Launcher and DreamLight Constellation apps into the LightWave folder. Also, move the DLI_Superballs folder into your Documents folder. 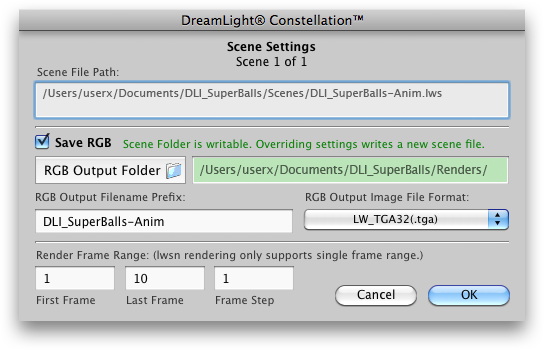 Double-click the DLI_SuperBalls/Scenes/DLI_SuperBalls-Anim.lws scene file to load it into LightWave Layout. 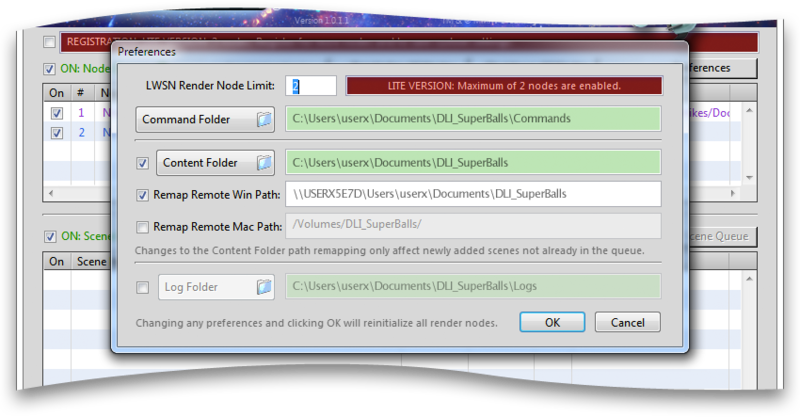 Click yes if asked to change the content path, otherwise it’s already properly set to the DLI_SuperBalls folder. OPTIONAL: Set the Render Globals->Render: Multithreading to half of the threads available on your computer because for this test we’ll be rendering on the same computer that we may want to use for other work. For example on a 12-core/24-thread Mac Pro set it to 12 Threads or on a 4-core/8-thread MacBook Pro set it to 4 Threads. Don’t forget to set the multithreading setting back to automatic when done with this test. Quit Layout. This saves the multithreading setting to the Layout config file so that it may be used by lwsn. Launch DLI_SNUB-Launcher to check that the lwsn Path and Config Folder fields are green and set them if necessary as outlined in the Standalone (Mode -3) Render Quick Tutorial above. Click the Content Folder checkmark button to activate the custom Content Folder button & field. It should default to the DLI_SuperBalls folder that was set in Layout and be highlighted green. If not, simply drag the DLI_SuperBalls folder from inside your Documents folder and drop it onto the Content Folder button or field. Click the Open Batch Render Settings (-2) button to open the Batch Settings drawer. Set the First ScreamerNet Node # to 1, Turn on the Through Last Node # check mark button and set the last node # field to 2 because we’ll run two lwsn render nodes on this one computer. The Command Folder field should default to the DLI_SuperBalls/Commands folder and should be highlighted green because DLI_SuperBalls was set as the Content Folder in Layout. 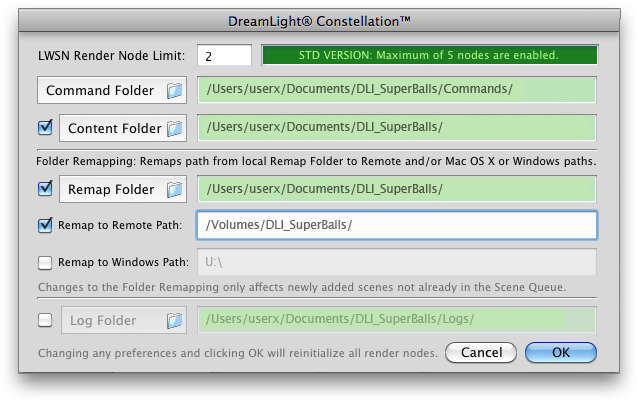 If not, simply drag the DLI_SuperBalls/Commands folder to the Command Folder button or field to set it. 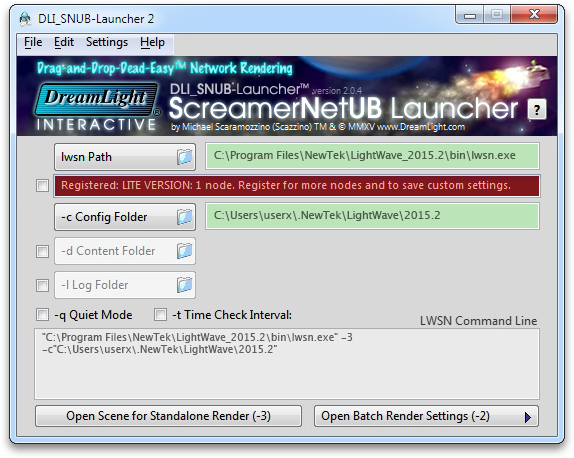 Click the Launch ScreamerNet lwsn Nodes button. This will launch Terminal/Command Prompt, with two windows, each running an instance of lwsn. They will report “Can’t access job file…” because there are no job files yet. 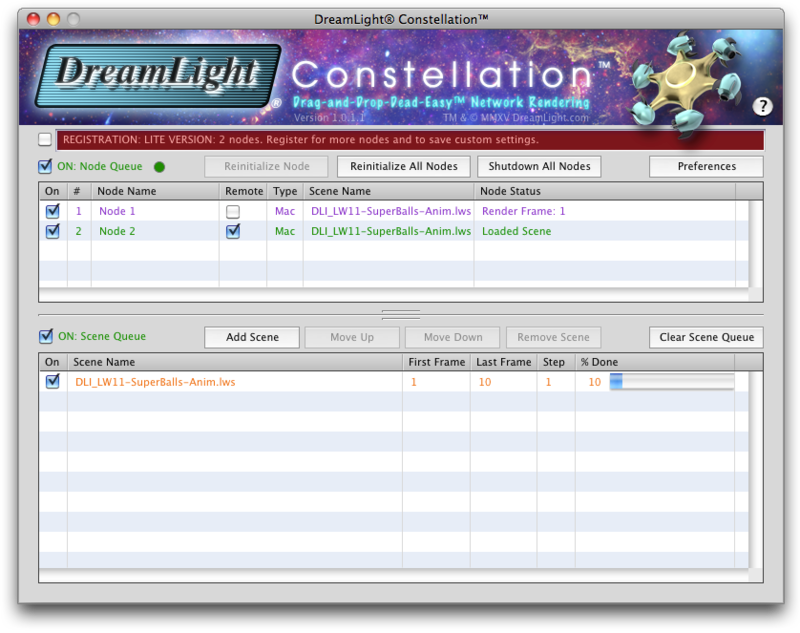 Launch DreamLight Constellation and open the Preferences panel. The Command Folder and Content Folder fields should be highlighted green and defaulted to the DLI_SuperBalls/Commands folder and DLI_SuperBalls folder respectively because the Content Folder was set to DLI_SuperBalls in LightWave Layout. If not, simply drag DLI_SuperBalls to the Content Folder button or field and/or drag the DLI_SuperBalls/Commands folder to the Command Folder button or field. Then click OK. 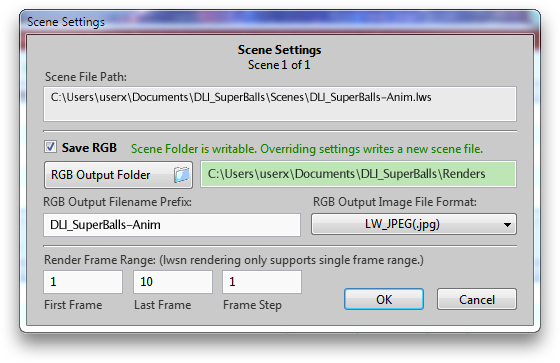 Drag the DLI_SuperBalls-Anim.lws scene file onto the Add Scene button or the Scene Queue to open the Scene Panel. 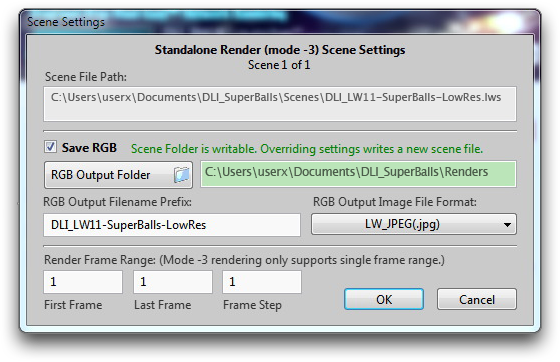 Then drag the DLI_SuperBalls/Renders folder to the RGB Output Folder button or field and click OK. This will add the scene to the Scene Queue and begin rendering. You may add as many scenes as you like to render and they will all render in order. You may move scenes up/down in the Scene Queue to change the render order and disable/enable scenes as needed. The difference between batch rendering as outlined in this tutorial and network rendering is only that the lwsn nodes are running on different computers rather than all on the same computer. The setup is pretty much the same except the LWSN nodes access the Content Folder, Command Folder and RGB Output Folder over the network. All computers must have read access to the same Content Folder and they must all have read/write access to the same Commands Folder and RGB Output Folder. There are many different ways to set up a network rendering system. This is an easy basic setup in order to learn and test DLI_SNUB-Launcher and DreamLight Constellation with a known simple setup. As such, this setup is also useful for troubleshooting. Once you are successful with this easy basic setup feel free to experiment with other custom or more advanced network rendering setups. In this tutorial we’ll be using two computers. Both Mac OS X Macs or both Windows PCs. 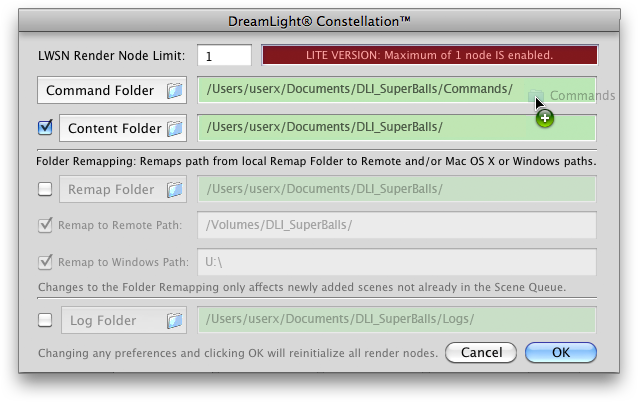 LightWave’s built-in network controller does not remap Mac/Win paths so all computers must be the same platform when using LightWave’s built-in network controller but since we’ll be using the new DreamLight Constellation network controller, which does remap Mac/Win paths, we’ll be adding cross-platform render nodes in a subsequent tutorial. If following this tutorial with the FREE Lite version please note that the FREE Lite version only allows 1 node at a time, so you’ll need to test the local node and the remote node separately, one at a time. Once you are sure everything runs to your satisfaction you may register to allow more render nodes. In this example tutorial. The first computer will serve as the host computer which will have the Content Folder located on it. It will run the DreamLight Constellation network rendering controller and it will also run one LWSN rendering node with DLI_SNUB-Launcher. The second computer will be a remote rendering computer that will run a second LWSN rendering node with a second copy of DLI_SNUB-Launcher and access the host computer remotely. Before beginning be sure that LightWave 3D is installed and tested on both computers so that each has the LWSN rendering component available and once LightWave 3D Layout is run on each computer it will create a valid config file on each computer. Install LightWave 3D on both the host and remote computers if not already installed. Launch and quit Layout on both computers from an administrator user to create a valid config file on each computer. Place the DLI_SuperBalls content folder in the Documents folder on the host computer. 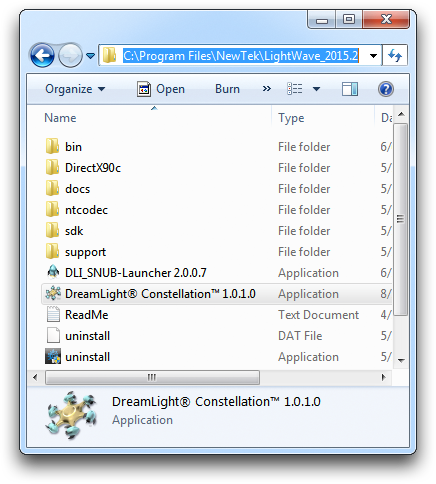 Place a copy of the DLI_SNUB-Launcher 2 and DreamLight Constellation applications in the Lightwave 3D folder on each computer as outlined in the Batch (Mode -2) Render Quick Tutorial above. 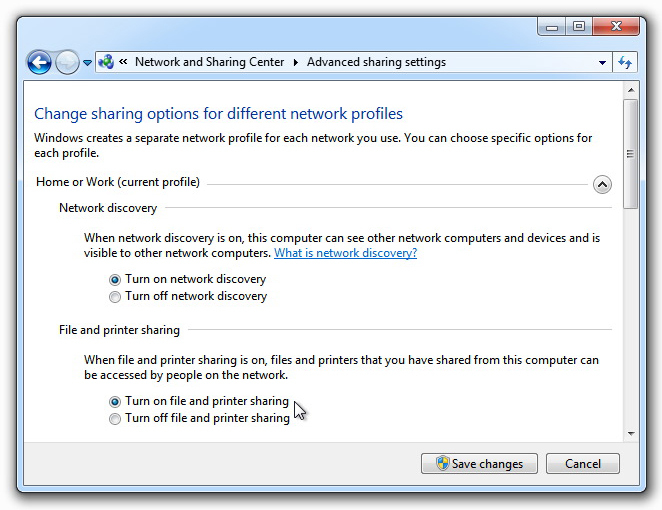 Set up sharing on the host computer. 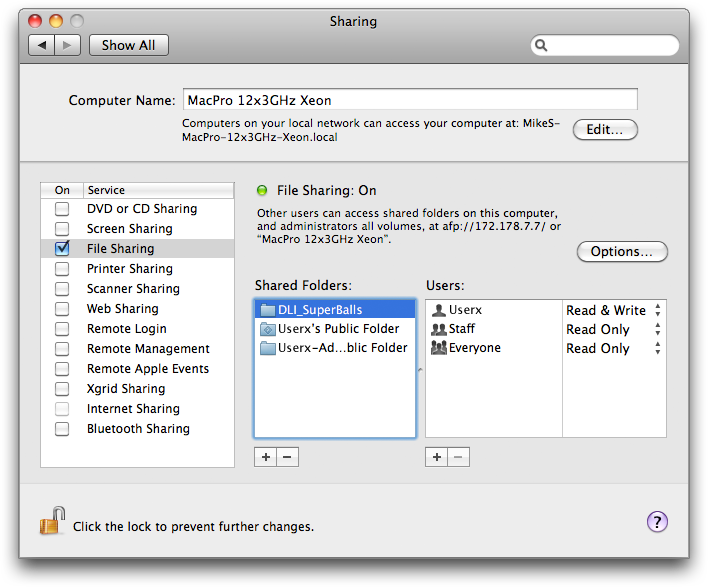 Mac OS X users activate File Sharing in System Preferences on the Mac that will be used as host to share the content folder and will run the network controller. Drag the DLI_SuperBalls folder from the Documents folder to the Shared Folders list and set the a user to have read/write permissions that you’ll use to log in from the remote Mac. 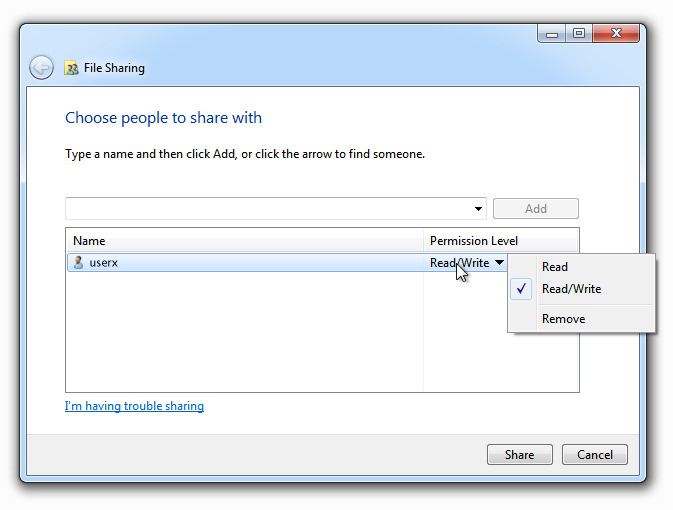 Windows 7 users activate File Sharing in the Network and Sharing Center in the Control Panel’s Network and Internet section on the computer that will be used as host to share the Content Folder and run the network controller in LightWave 3D Layout. Go to Sharing Options, and then Advanced Sharing Settings. Click: Turn on file and printer sharing. and Use user accounts and passwords to connect to other computers. Then click Save Changes. 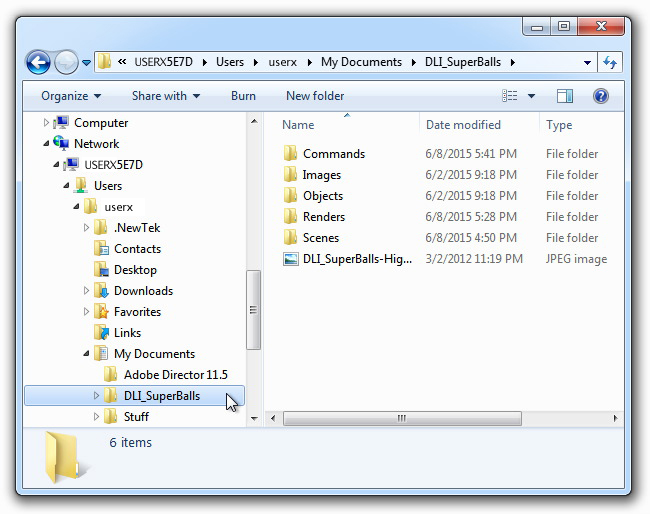 Share the DLI_SuperBalls content folder with your user name for Read/Write access. Mount the host computer’s content folder on the remote rendering computer. On the remote rendering Mac, select the host Mac in the Finder’s sidebar under Shared. Click the Connect As… button and log in as a user that has permission to read/write to the shared DLI_SuperBalls folder. Once connected you will see a list of available volumes and folders to mount. Double-click on DLI_SuperBalls to mount the shared content folder. On the remote rendering computer, select the host computer in the Windows’ sidebar under Network. Log in with your username. Once connected select the content folder Users\userx\My Documents\DLI_SuperBalls. Launch DLI_SNUB-Launcher on each computer. Check and set the lwsn Path field and Config Folder field if necessary, as outlined in the Standalone (Mode -3) Render Quick Tutorial above. In DLI_SNUB-Launcher on the host computer, turn on the Content Folder checkmark and drag the Documents/DLI_SuperBalls folder to the Content Folder button or field. Also Open Batch Render Settings and drag the Documents/DLI_SuperBalls/Commands folder to the Command Folder button or field. Set the First ScreamerNet Node # field to 1 and click the Launch ScreamerNet lwsn Nodes button to launch LWSN in Terminal/Command. Back on the host computer launch DreamLight Constellation. Open the Preferences Panel. Drag the Documents/DLI_SuperBalls/Commands folder to the Command Folder button or field. Turn on the Content Folder checkmark and drag the Documents/DLI_SuperBalls/ folder to the Content Folder button or field. 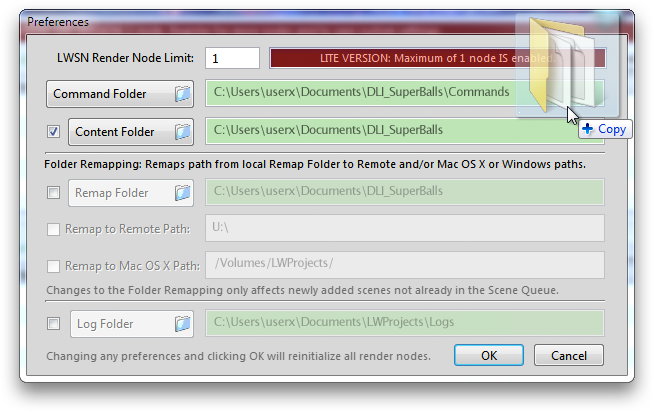 Turn on the Remap Remote checkmark and type the remote path to the shared DLI_SuperBalls folder as seen in DLI_SNUB-Launcher on the remote rendering computer. Click the OK button. Set Command Folder, Content Folder and Remap Remote Mac Path fields on Mac OS X. Set Command Folder, Content Folder and Remap Remote Win Path fields on Windows. This will initialize the nodes which should both show up in the Node Queue. Set Node 1 to Local by turning off the Remote checkmark and set Node 2 to Remote by turning on the Remote checkmark. This will reinitialize the nodes each to use the proper content folder path for each of the local and remote nodes. The FREE Lite version now only allows one node at a time, so you can test a local and remote node individually, one at a time by re-configuring each as node 1. For additional step-by-step tutorials please refer to our DreamLight Constellation tutorials and our in-depth white paper Mastering LightWave 3D ScreamerNet LWSN.